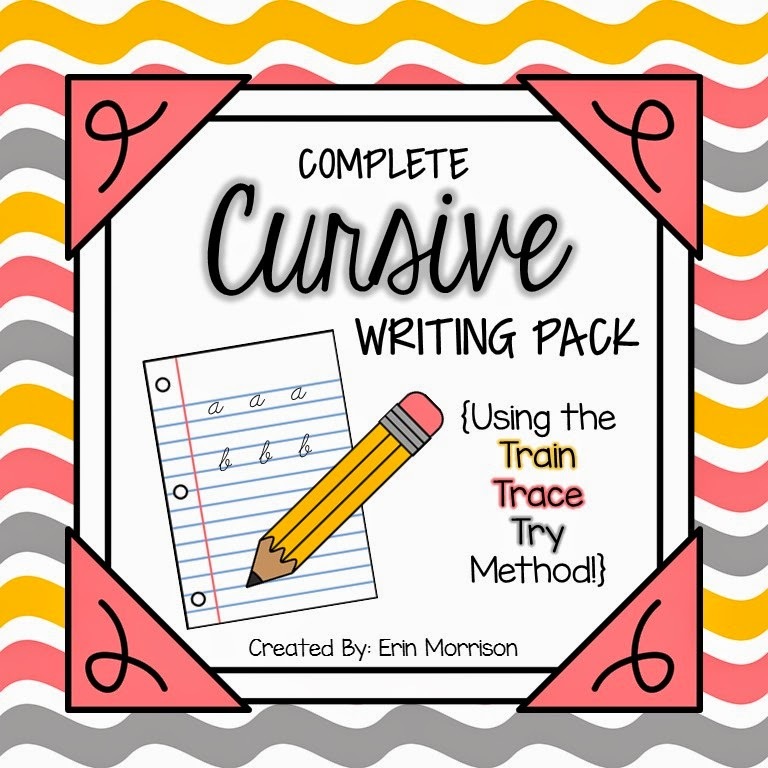 The Open Door Classroom: Cursive Writing Using the Train-Trace-Try Method! Cursive Writing Using the Train-Trace-Try Method! Cursive writing. Everyone has their opinions on whether to teach it to students or not. My personal opinion is that cursive writing is still important for kids. Even though it probably doesn't need as much emphasis as we've put on it in the past, there are several reasons why kids need to be able to read and write in cursive. 1. Students need to be able to sign their name on important documents, job applications, and more. 2. Kids should be able to read cursive writing for a variety of reasons. Letters from grandma, important historical documents, etc. 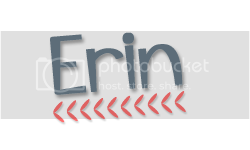 Okay, I'm getting off my soapbox now! For the past couple of years, I've been teaching cursive writing to my third graders. I didn't love the way I was teaching it and wished that I had more resources to use with my kiddos. So I started doing some research about the cursive writing verbal paths and other strategies to use with students and then put together a COMPLETE Cursive Writing Pack! This pack is unique in the fact that it uses a strategy called Train-Trace-Try. I came up with these three words after thinking about how we need to scaffold cursive writing instruction. 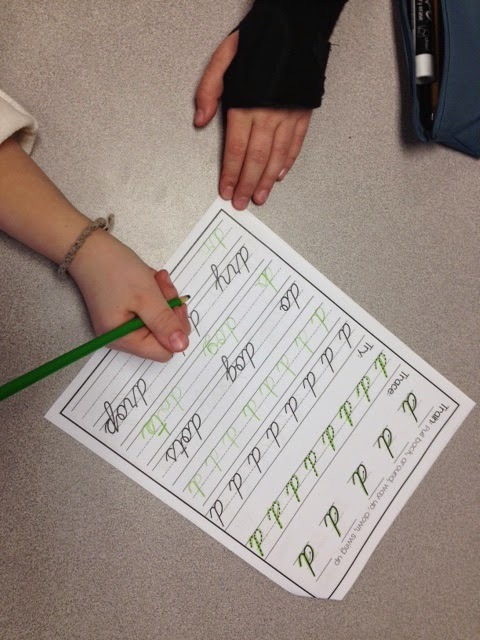 First, students need to be trained how to form each letter. This is where the verbal paths come in. In the train step, students can either trace the letter with their finger or with a pencil but the most important part is that they are saying the verbal path in their head each time they form the letter. Saying this over and over again will help the kids remember the formation. 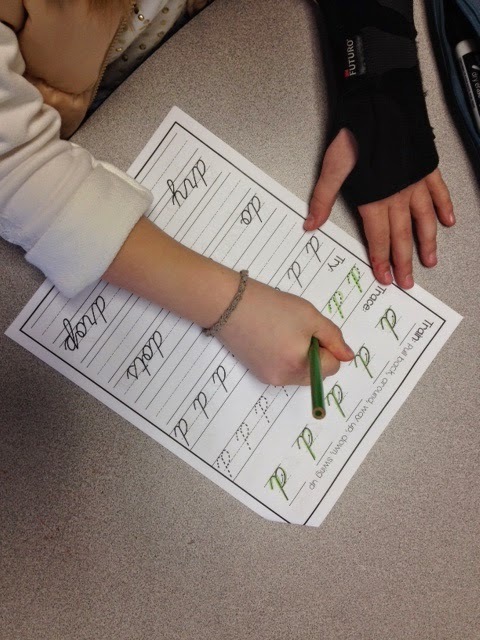 In the trace step, students can trace the letter several times. I've actually found that it's more motivating to students to use a colored pencil during this step. They can see their writing easier and it's fun to use different colors! I encourage my students to still say the verbal path in their head as they trace the letters. The last step on each page is to try. In this step, students will try to form letters and words on their own. This is an important step because the kids learn how to link the letters together to form words. You can have your students use a regular pencil or a colored pencil for the step. I especially like the Crayola Erasable Colored Pencils. Also included in this Cursive Writing Pack are lowercase and capital letter posters to display in your classroom. To see what all is included, check out the previews below! If you'd like to grab a copy of this cursive writing pack, click here! I agree that kids need to learn cursive writing. It's technically not "curriculum" for us, but I like to sneak it in at the end of the year after state testing. It's definitely worth it for the kids to understand how to sign their name and read the cursive writing! Love your TpT packet, it's on my wishlist! The fastest, clearest writers avoid cursive, though they are not absolute print-writers either. Highest speed and legibility in handwriting belong to those who join some letters, NOT all: joining only the most easily joined letters, leaving the rest unjoined, with print-like shapes for letters whose printed and cursive shapes disagree. Why not teach children to READ cursive — along with other vital skills, such as a form of handwriting that is actually typical of effective handwriters? Educated adults quit cursive. In 2012, handwriting teachers across North America were surveyed at a conference run by Zaner-Bloser, a cursive textbook publisher. Only 37% wrote in cursive; 8% printed. The majority (55%) wrote with some elements like print-writing, others resembling cursive. ﻿ Questioned document examiners (specialists in identifying signatures, verifying documents, etc.) tell me the least forgeable signatures are the plainest — including print signatures. ALL handwriting, not just cursive, is individual (and involves fine motor skills). That is how a first-grade teacher tells right off (from printing on unsigned work) which student wrote it. Mandating cursive to support handwriting is like mandating top hats and crinolines to support the art of tailoring. I was never welcomed in my Husband’s Family, I was hated by all his siblings especially his Mom, she never want seeing me around her or attending the same occasion. My Husband changed and drove me out of the house just few weeks after he visited his Mom, His mother brainwashed him and took him to evil gathering where there deceived him to join them and abandon me because my spirit will never welcome their union and I might cause heavy harm to their gathering. He accepted their request because of his mother’s influence and decided to send me away, froze my account and restricted me from seeing our kids. I took this case to so many spiritual leaders but none can bring the solutions I needed. I went online after 4 wasted months to seek for any help. I was lucky to find testimonies and recommendations about Dr. Wakina and others, but I chose Dr. Wakina because the testimonies said about him looks legit and are related to my case. People think that cursive writing is unnecessary. Cursive writing is only used in signatures. But i think Cursive writing stimulates the brain. Cursive writing helps train the brain to integrate visual and tactile information, and fine motor dexterity. I think cursive writing is necessary.